Learning to ride a bike can be a tricky task with plenty of bumps and bruises along the way. Trying to learn to pedal and balance at the same time can be daunting for some kids. Not everyone has the same sense of balance, and thinking about pedaling when you’re already nervous about staying upright in the first place can be a recipe for a really tough time. The best balance bike allow kids to get used to sitting on a bike and moving around, without pedals getting in the way. Granted, actually riding and pedaling on a regular bicycle is different than waddling around on a balance bike, but these still make a great first step for younger children. By Max Shumpert: This article has been updated to reflect the most accurate information regarding balance bikes available for those who are interested in balance bikes for their kids. The best 8 available have changed, and information has been added to assist individuals in finding the best balance bike currently available on the market. The FAQ has also been updated. To put the concept of a balance bike and our picks into perspective, let’s discuss the significant changes going on in your child to guide your choice. They lack the coordination at this point to balance. However, it’s the ideal time to get them used to the idea of sitting on a ride-on toy. To look at its product description, you’d think that the WOOM1 was part of the lineup of a higher-end regular bike. That’s one example of the attention to detail that went into its design and construction. The WOOM1 includes a lot of extra options that help justify its higher price tag. They include features such as easy assembly, a generous range on the seat height, and hand brakes to make that critical transition. The manufacturer takes child safety seriously with a well-designed frame and geometry. The saddle has an anatomically adapted design for a comfortable ride. The bike is spendy for what it is. Based on the weight of the bike, it’s suitable for a child up to 24 pounds. The bike has several other options that make it stand out from the bunch. It includes a steering limiter to avoid sharp turns that could lead to a fall. It’s elastic so that it doesn’t jolt the rider. Also, it’s removable which is a plus. Your child will have their choice of blue, green, red, or purple. The manufacturer calls the last option, purple haze, to appeal to Mom and Dad, presumably. It comes in both a classic and plus version. The latter is not the same one tricked out, but instead is a larger model for older children. It’s worth mentioning that the shipping commences in mid-June. 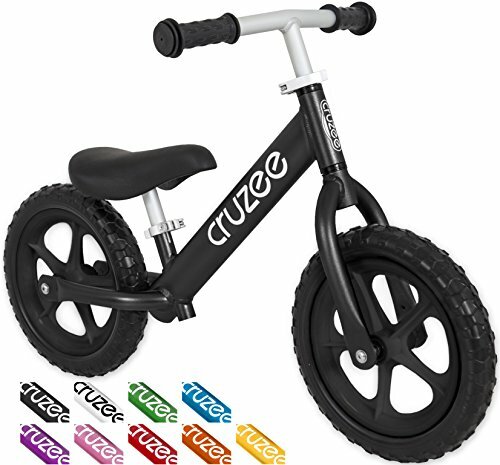 The Cruzee UltraLite Balance Bike is just what the name suggests—an uber-light ride. Even smaller kids won’t have any problems getting it to move and glide across the pavement. The bike comes in your choice of 10 frame and two wheel colors. It’s a good-looking ride with a solid feel to it. There’s no doubt that it’s durable. The manufacturers designed this balance bike for comfort from the padded saddle to the cushy grips to the rounded edges. We liked the cushy tires making it all right for indoor use if you desire. They are also puncture-proof which is always welcome. The last thing you want is an upset child because he can’t ride anymore because of a flat. The range of seat heights is generous to accommodate children of all sizes. It makes it a better investment for parents since their kids won’t outgrow it quickly. You can adjust the handlebar up to five inches too, giving you lots of wiggle room to home in on the ideal height for your child. The manufacturer bills the Cruzee balance bike as one meant for children 18 months to five years which seems a bit of a stretch, especially given the photos of older kids on it. It is more expensive too. The bike has several other modifications that clearly show the manufacturer had the parents in mind too. The frame is rust-free and has sealed bearings to keep the bike riding smooth. Parents should take the age range on the Cruzee toddler bike with a grain of salt. While it’s well-made, we feel skeptical that it would last through five years. The independent thinking still persists but also moves toward wanting a better understanding of their world. It’s the time for questions—and lots of them! You’ll see balance bikes that look, well, more like a bike. Most are simple models that are lightweight with fat tires. They provide a means for walking with it to take that next step. While they can’t use them properly yet, you can look for models with added features like hand brakes. Pay attention to the seat height range to make sure that the bike will last a few years. The Banana Bike LT has a curvy shape that just says fun. It has lots of the features we like in bicycle for children in this age range at an affordable price that makes it worth a look. 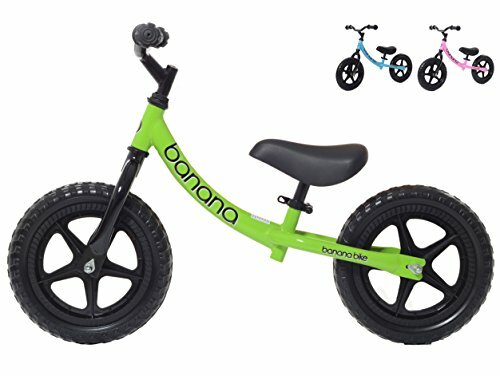 The Banana balance bike has large foam tires that keep the weight in check for little ones just starting to ride. It includes features that we’d see in a regular model such as a quick release for adjusting the seat height. The price certainly makes it worth considering. That said, it’s a well-made product with no shortcuts on the materials. That’s evident with the full-metal headset too. The geometry of the bicycle is well suited to children with enough room between the seat and the handlebars. While it’s a deal breaker by any means, the bike only comes in three sizes. Typically, toys for children in this age range are bright and vibrant. These seem muted in comparison. The seat height range is limited at 3 ½ inches, but again, the value price means it won’t be as much of a hassle to get another one once your child has outgrown it. As the name suggests, it has a banana frame and seat that is comfortable. And did we say how cute this bike looks? The Banana toddler bike lacks some of the bells and whistles of more expensive products such as turn limiters and hand brakes, but it’s not unexpected. The manufacturer also produces a GT model for older children with a higher profile. The Strider - 12 Sport is an upgrade from the manufacturer’s classic model. It has some extra features that make it worth a look over the other one. It is more expensive but a reasonable cost. The Strider bike is well-made which is evident at first glance because of its design and construction. Like many balance bike, it has a solid and wider center tube that is narrower so as not to interfere with the riding experience. This model differs from the classic version with a handlebar pad and a padded seat. It is well-designed with a geometry that is optimal for children in this age range. The Strider balance bike is well-made all through the construction with a lot of care taken to keep the needs of parents in mind. The tires, for example, won’t scuff up your floor though traction is sometimes questionable on these surfaces. The bike has some extra options, but it is a bit spendy for a steel bike. It doesn’t have turn limiters, and foot brakes are an optional feature. The bolts are exposed, leaving a child vulnerable to a scrape if he hits them accidentally. We’re also skeptical of the recommended age range. While it’s okay for these children, we think it’s too small for older kids. Parents will like the tool-free adjustment on the seat and handlebars for quick hassle-free changes. The puncture-free tires are always a plus too. It comes with an extended seat post too which can help bridge the gap until you upgrade to a regular bicycle. The grips are well-made to protect little hands from fatigue from riding or taking the occasional spill. Even though it’s a steel bike, it’s small and lightweight enough for smaller children. 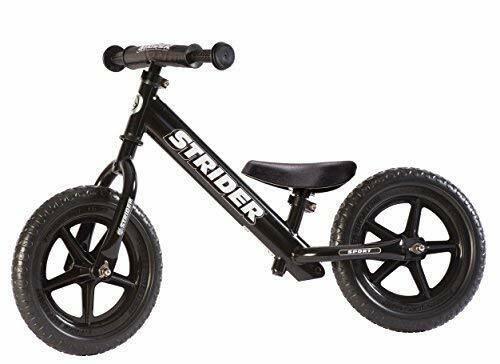 If you’re considering this brand, we’d suggest paying the extra $20 to get the Strider Sport balance bike model versus the Classic one. The extras are worth the money for the comfort they bring to the ride. Perhaps fueled by all the questions and answers, imagination captures the mind of a child this age. Curiosity is a good thing that can help them understand how a balance bike works. It makes sense because their brain is creating those neural connections that can bridge the way toward better coordination and ultimately, balance. It’s a good time to make a point of emphasizing safety such as staying out of the street and wearing the best bicycle helmet. The Green Neo Balance Bike (v2s) stands out with several unique features that strive to bring added comfort and durability to your child’s riding experience. It comes in nine colors with your choice of a steel or aluminum frame and air or foam tires. The most noticeable feature is the design of the frame with its step-through design. The bike looks wider and has a more sturdy feel about it become of its geometry. The other thing that’ll catch your eye is the footrest strategically placed where someone might put their feet while coasting on a regular bicycle. 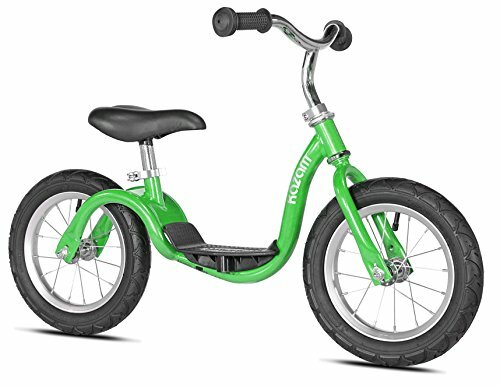 The design of the Green Neo toddler bike speaks to the comfort of the rider with a comfy saddle and cushy grips. There is plenty of room between the seat and handlebars too for the ideal geometry for a young rider. The cons are in the features we’d like to have that the bike lacks such as turn limiters and hand brakes. While the former isn’t a deal breaker, the latter is a bummer since it’s marketed to an age group that would start using them. The other concern rests with the width. Children with smaller frames might have trouble getting astride it correctly. It also makes the exposed bolts more of an issue too. The model we considered has air tires. That’s a better option for a bike for children at this age because it provides welcome cushioning and superior traction. The extra weight isn’t a big deal with a growing child. The Green Neo balance bike ticks off a lot of boxes for us regarding child-friendly features and hassle-free maintenance for Mom and Dad. The primary concern rests with the width that we discussed earlier. Otherwise, it’s affordable with an excellent suite of options. The Critical Cycles Cub is a value-priced model that takes a page from regular bicycles with six unique color themes. They are eye-catching. 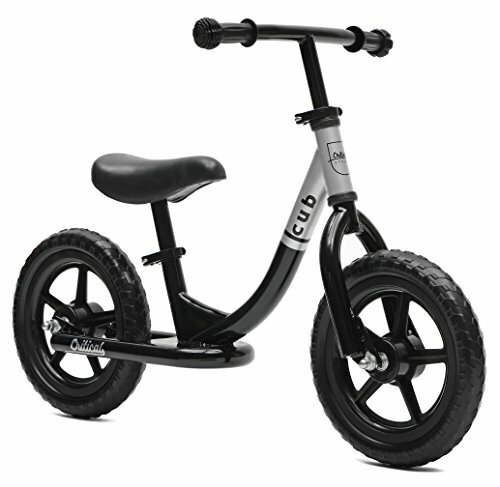 The Critical Cycles balance bike has puncture-free foam tires which cut down on the weight of this steel frame bike but provide less cushioning and traction. The model is best suited for pavement instead of indoor use. Of course, an advantage of opting for this bike is its budget-friendly price. While it is adjustable, it won’t hurt as bad when you have to buy a new bicycle for your child. You can adjust the handlebars and seat height to give you some extended use which makes it even more of a value for parents with a limited budget. Like some bikes we considered, the Cub has a wider profile which can make riding more difficult for children with smaller frames. Another issue rests with the footrest. It extends the entire length of the saddle and even sticks out a bit. Little ones may hit if they’re not paying attention. It’s more of a problem since it has exposed bolts too. The Critical Cycles toddler bike lacks some of the nice-to-have features you’ll see in higher end bikes, but that’s not unexpected nor a significant issue. It is, after all, an economy model. So, while it has a footrest, it doesn’t have brakes which we’d put more in the must-have category considering the age of the rider. However, it is CPSC-compliant. If money is an issue, it’s a suitable balance bike as long as your child isn’t on the petite side. With the adjustable seat and handlebar, you’ll get plenty of use out of it until they outgrow it. Your child’s imagination is developing even more with a keener grasp of things outside of their reality. It’s an excellent time to introduce them to the possibilities of exploring the world around them. They’re capable of getting the concept of handbraking, so it makes sense to have them use a bike that has this feature. It’ll make the transition to a regular bicycle that much smoother. Sturdiness and durability are desirable too as your child likely will start pushing the boundaries of what their balance bike can do. Look for features like air tires with some kind of tread for traversing a variety of terrains. 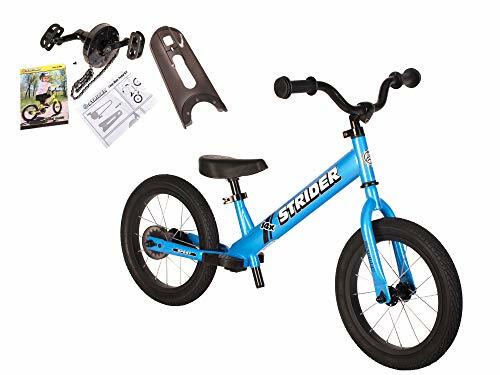 Though a bit more expensive, the Strider - 14X is two products in one, being both a balance bike and a first regular one with the addition of pedals. That justifies the higher price tag. The bike shines with features that improve its usability as both a balance and regular one. Reading the manufacturer’s specs on it, you’d think it was an adult bike with all the bells and whistles. 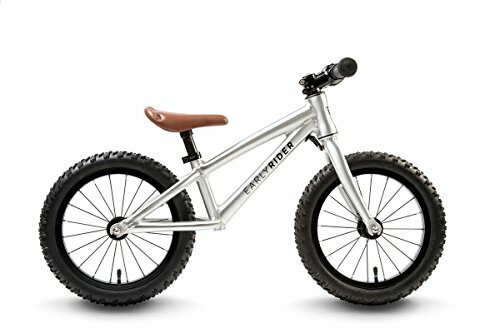 The Strider toddler bike is built for durability which is evident in the heavier weight and steel frame. It’s also designed for comfort with excellent geometry and padded saddle. The add-on pedal kit is included with the bike. It has everything you need including the Allen wrench. As a balance bicycle, it’s excellent. It’s sturdy enough to take some rough handling. The benefits exist with both its uses. The adjustable seat height range is generous to accommodate a growing child. It also is heavier which makes it sturdy and able to handle a variety of terrains. As a regular bike, it has desirable features such as a chainguard to make riding safer for those children new to biking on a two-wheeler. It also has a narrower profile, making it an excellent choice for children with smaller frames. Other than the price, there aren’t many downsides to this bike. The bolts are exposed, but it’s probably less of an issue with an older child. It is heavier too than comparable models. It’s hard to ding it too much on that score, considering its end use. The bicycle has coaster brakes rather than a hand version. We’d prefer the latter. The Easy-Ride Pedal Kit is a brilliant addition to this bike that extends its versatility into the regular bike realm. We appreciated the addition of training information that offers sound advice on how to teach your child to ride a bicycle. It includes a coaster brake which we liked. It also has a removable footrest that is well-placed so as not to interfere with riding. It has air tires which provide more traction and cushioning for more adventurous biking. The Strider is a worthwhile investment and a definite upgrade in the balance bike offerings. It has a grown-up feel about it that children are sure to enjoy. Looking at the Trail Runner XL, it almost hard to believe that it’s a balance bike. It has a presence with its sporty frame and fat tires that are sure to turn some heads. It differs from other balance bikes in that it’s built for heavy use and rough terrains. It’s lightweight for jumping curbs and more aggressive riding. The geometry of the Trail Runner balance bike is its most outstanding feature. The specs are optimal for children in this age range. The handlebars are carbon fiber which shaves off some weight to make it a fun choice for hitting the trails too. It’s a bike meant to last and to keep up with whatever challenges your child wants to take it through and more. It’s lightweight, thanks to the aluminum alloy frame. It strikes a delicate balance between durability and weight. The Trail Runner toddler bike doesn’t have a footrest or brakes. The latter is shame in light of all the other things in its favor. Another concern exists with the handlebars. Unfortunately, they’re quite narrow, making it a poor choice for larger children. The bike has air fat tires to provide more cushioning. They have a knobby tread, making the bicycle suitable for off-road use. The standard model has a standard set. It includes a steering limiter which almost seems odd for a bike for this age group. The saddle is shaped more like an adult model with a faux leather covering. There’s no denying that it’s a good-looking bike with an excellent set of features that justify its higher cost. However, the shorter length of the handlebars is problematic in some cases. What Are Balance Bikes and Why You Should Consider One? A balance bicycle resembles a standard model only it doesn’t have pedals. Otherwise, the two are identical. The child moves it forward with a walking motion instead of pedaling. The premise is that it makes learning how to ride easier for children which, in turn, benefits parents. As you’ll see, proponents are vocal about its superior training method. How Do Balance Bikes Work for Training? Using this bike breaks the training into two phases, pedaling and balancing. The former is the simpler of the two skills once they learn the action. The latter is the tougher of the two and the one that leads to the inevitable fall. It helps to keep the learning ability of your child in mind when using a balance bike. During the first years of life, numerous neural connections develop that result in increasing cognitive function. Grasping two skills at once challenges young minds. The impetus for change was a desire to travel faster using wheels. The concept went back to the days of Leonardo da Vinci. Bear in mind that land travel meant walking or riding. But horses were unpredictable. In the early 18th century, inventors tried different designs of the so-called velocipedes with the most successful being the dandy horse. Otto Schillinger and Baron Karl Drais of Germany invented a prototype of it with an invention called the Laufmaschine in the 1810s. It was a barebones frame with wheels. Riding it involved gaining momentum and raising your feet to coast along and take a welcome break until you had to run again. Likely you have images of Fred Flintstone in your head right now. The idea was simple but not efficient. It spread through Europe where other inventors refined it to become the dandy horse. The rider had more control but still relied on foot power to keep moving. The combination of the motion and the lifting of the feet taught the biker how to balance. Other inventors made further improvements on the design with the addition of pedals in the 1860s. That ushered in the age of the bicycle as we know it today. When to Get a Balance Bike for Your Child? It’s helpful to consider the developmental changes going on in your child to answer this question. At two years old, a toddler is more adventurous and exploring their world. You’ll likely notice copycat behavior. Children start to show a preference for realistic-looking toys. They also can understand directions better, making a balance bike an excellent choice. Still, the choice rests with you, the parent, to assess your child’s maturity level and whether they would use and enjoy it. Preschool age or even younger is typical. How Old Before a Child Can Ride a Bike? One way to assess if it’s time is by the developmental milestones your child has met. At preschool age between three and five years, most have rudimentary balance skills. That along with a curiosity about their world sets the stage for a successful transition to learning to ride a bicycle. That copycat behavior comes into play too. Many children begin their experience with wheeled vehicles with ride-on toys or a tricycle. The chances are you remember tooling around the house, trying to dodge others and the family dog. That is one of the problems with a tricycle versus a bike. The wider rear of the former makes it difficult for children to gauge turning safely. That makes them easier to tip too. Riding a tricycle won’t teach them how to balance. Instead, it may foster a false sense of security especially if they ride it fast. Starting your child’s journey with a balance bicycle versus a tricycle offers several benefits. First, you can introduce them to it at a younger age. That can, in turn, steer brain development. Second, it encourages physical activity at a time when children want to learn more about their world. It’s a natural segue to a habit that can last a lifetime leading to a better quality of life. Finally, it allows the child to learn one skill at a time to give each one the proper focus. However, experts differ on whether they learn to ride faster. It comes down to mastery rather than timing. There is a standard type of a balance bike that is essentially just one without pedals. They differ in their geometry, features, and accessories. Each has their pros and cons. You’ll see models in a range of sizes with suggested ages based on average figures. The keyword is average. You need to take into account both seat height and tire size. You can start by measuring your child’s inseam from a pair of pants. That’ll put you on the right track for choosing the correct tire size. The figures are comparable, give or take an inch or two. Tires that are 12 inches in diameter are suitable for younger children up until age 5, depending on their height. After that, 14 inches ones are a better choice to match your child’s growing body. The weight of the bike should be about 30 percent of your child’s weight to strike the correct balance between durability and maneuverability. It’s especially important for younger children who are new to using a balance bike. A bike that is too heavy will be harder for them to push, and, thus, get momentum to start coasting on it. Choosing the right one is a matter of balancing features with weight. The material is a critical factor which we’ll discuss below. The other thing to consider is the feature set of the model. For example, foam tires are lighter but have disadvantages over air ones which can drive up the cost. The short answer to the question of footrests is that they are not necessary. They aren’t a substitute for pedals and can interfere with the skill that your child is trying to learn—balance. If they’re present on the bike, take a look at the size and shape. Ideally, it is less than the length and width of the seat. Anything more is likely to get in the way while your child is riding it. You’ll find models with it as part of the frame or removable which is desirable as your child gains confidence riding a balance bike. Remember, it’s also a factor with its weight. Next, consider the seat height. Look for one with a range of about one inch less to two or more inches longer than the length of your child’s inseam. That’ll give you some room for growth. Adjust it as you would for your bike with your knees slightly bent when seated in the saddle. That’ll allow for plenty of space and make it more comfortable to ride. It’s helpful to focus your search on models with an ample range for getting the most value out of your purchase. You’ll see this figure expressed as a range. The wider it is, the more use you’re likely to get out of the bike. However, you need to weigh it along with other features that are more desirable as your child grows. You’ll see some balance bikes that include turning limiters such as the WOOM1. The theory is that they’ll prevent your child from jackknifing. There are different types which vary on the degree to which they’ll stop aggressive steering. We prefer elastic ones that will absorb some of the shock. For our take, they aren’t needed either. You’ll likely think that brakes are a no-brainer. They are for bikes for older children at preschool age and older. For younger kids, it’s a distraction. You’ll find models with coaster or hand brakes. The latter is the better option between the two. Having this feature is essential if you want only want to buy one balance bike before moving onto a regular one. Most balance bikes have a straight handlebar with grips on the ends. Others have a curved shape as you’d see on the classic banana bicycle. We’d opt for the former as the better one. Pay attention to other specs too such as its length. That becomes more of an issue with children with larger frames that make a wider one an ideal choice. Also, look at the grips. Hand fatigue occurs even in young riders. Cushioned ones are your best option. Some include caps on the ends that will cover a child’s hand even when they fall. Then, we have the all-important question of cost. You’ll find balance bikes anywhere from under $100 to prices north of $200. Much depends on the features and materials. As with any bicycle purchases, it’s a matter of give and take. You can approach it in two ways. You can opt for a less expensive model with fewer features for your toddler and step up with an upgrade when they reach preschool age. That one can have things like hand brakes which are more appropriate when they’re older. The alternative is to invest in one that will suffice until you transition them to a regular bicycle. These models will have additional features such as longer seat tubes to resize the bike as your child grows. They may include other options that will add to your cost. Our advice is to do the research and make an informed purchase to get a suitable model throughout its use. Part of the cost of a balance bike rests with your choice of material. Like a standard bicycle, you’ll see a range of options with matching prices. Each has their pros and cons too. Of the three, the last one is the new kid on the block. It is a high-tech option with the advantages of being lightweight and able to accommodate older children. On the downside, it’s not indestructible because it can flex. That makes them problematic when your child gets more adventurous with an increase in risk-taking behavior as they age. The other thing to bear in mind is cost. High-tech materials come at a price. Our take is that it’s hard to justify the price for a product that your child will outgrow relatively quick. Putting that money into a regular bicycle makes more sense. You’ll find a host of metal materials from stainless steel to aluminum alloys—and everything in between. As a rule, less expensive models don’t contain aluminum. Steel bikes are stronger too but also are heavier. Then, there’s the question of rust. It’s not a matter of if but instead when if your child leaves it outside frequently. The decision between weight and additional features comes into the discussion, especially with younger and more petite children. Aluminum alloy bicycles are lighter which makes them an excellent choice for smaller children. They also won’t rust, offering some assurance that it will last for Mom and Dad. You’ll see a wide spectrum of proprietary types. Some models may have a mixture of both, with steel components used in places that will take the most stress and wear. You may not associate wood as a material for any bike, but there are several models out there that run the gamut from economy versions to high-tech products. Many look slick with fun designs. Birch is a common wood used because of its superior durability. You may see models with marine-grade materials too to improve their longevity. The impetus for these products is to make an eco-friendly version. If you choose this route, we’d advise you to research it carefully and read several verified reviews to get a quality bike. Now we’ve come to the question of whether or not you should teach your child using training wheels fitted on a regular bicycle. As we noted above, there isn’t a difference in timing as far as how soon they will grasp this skill. A child will learn to pedal and balance whether or not you opt for using training wheels or not. It boils down to the method of teaching and the degree of comfort for your child. We’ll discuss each one in detail. A regular bike is a natural transition from a balance model which is where its value lies. Your child learns the necessary skills without any detours along the way. And as you know, it’s something you don’t forget. Biking is often an intense aerobic activity. It a wise course of action to get children started early with the demands that it’ll make on their little bodies. Going this route allows you to focus on teaching your child to pedal before moving on to the tougher task of balancing. Proper installation is imperative because you’ll remove the tires in the process. You should adjust the training wheels so that they are just less than ¼ inch above the ground. Verify that both of them are equidistant to prevent tipping. Another option is to use a regular bike and remove the pedals to replicate the look and feel of a balance bicycle. If you have a limited budget, it offers a more affordable option in theory. On the downside, you’ll have to upgrade sooner because you’ll need a smaller one from which to start. Your child likely will outgrow it quickly. We’ll cover the conversion process in detail below. The debate is polarized on which method is better. The case for training wheels is that it gives your child a chance to get familiar with biking. They can learn to feel comfortable astride it. Then, once they’ve gained some much-needed confidence, you can take them off and turn the focus to balancing. The argument for a balance bike is that you can give your child a head start with learning how to ride because they can use them at a younger age. Proponents point to the fact that it is a sideways move to biking. Also, they learn the more demanding skill first since pedaling is much easier for them to pick up later. Let’s cut to the chase. Biking is the kind of skill that will involve a fall or two no matter which method you choose. The differences lie with the approach and how easy it’ll be for your child to catch on and ride. Training wheels teach your child to pedal without balancing coming into play. They provide that aspect to the experience but in a way that leads them in a misguided way. Balance bikes, on the other hand, put your child in the proverbial driver’s seat from day one. They power the bicycle on their own with braking and balance a part of the game too from the start. Children are typically ready for the big transition from four to two wheels around four or five. Then, it’s a steep learning curve to unlearning what they’ve known up to that point. That same gap doesn’t exist because they’ve started with a miniature bike, as it were. They may have even tried coasting themselves which gives them the edge on the balance skill. You can look at a balance bike as a replacement for the former along with the tricycle too. Neither serves a purpose if your child begins on a balance bike. The disadvantage of the training wheel method is that the child learns how to ride without an emphasis on balance, essentially teaching them something different. It can give them a false sense of security on the bike and make the transition to two-wheels more challenging and perhaps scarier. After all, that’s an enormous leap to make. When it comes to balance bikes, there aren’t many strikes against them other than the maybe the cost of buying another ride-on toy. A basketball or tennis court is an excellent option. A limestone trail is another possibility. While a grassy area may offer a softer landing, it’s a tougher surface on which to navigate. After your child is astride the bike, encourage them to walk along with it to get the feel of it. If it’s their first time, they may not sit on the saddle but instead continue at this pace. Don’t rush them. The next step is sitting on it while walking. Again, let your child make the call toward moving faster or even running on the bike. They may go back and forth between standing and sitting too. This phase is the most important one and shows the advantages of opting to teach them to ride by this method over training wheels. The penny has probably dropped by now, and your child has learned to go faster. Balance may come naturally with them lifting their feet off the ground and coasting along. Sometimes, they’ll need some instruction especially when it comes to things like stopping. As we discussed earlier, some bicycles have hand brakes, so you can teach them how to use them before they make a move to a regular one. The chances are that they’ll figure out how to stop with their feet without any coaching from you. The essential thing is to make sure they use their whole foot instead than their toes. Once they’re comfortable, they’ll probably look for other places to explore. It’s an excellent opportunity for you to set ground rules and safety habits like using a helmet. Many of the bikes we reviewed sell matching ones to complete the set. We strongly encourage all bicyclist, young and old, to always wear a helmet no matter where the trail takes you. Being scared to ride a bike is a natural reaction when trying something new. The first to remember is not to force the issue that will create a negative association with it. Biking is a fun activity that lends itself well to positive feelings about it. Use that in your favor to get over this hurdle. Praise your child when they take their first steps with a balance bike. Encourage them with each new skill they learn along the way. It’ll make the experience more enjoyable for you and your child. You can also try a little psychology to move things forward. Remember that copycat behavior we discussed earlier? Use it to your advantage and let your child learn with other children using balance bikes. It’s even better if they’re more advanced riders. That will encourage them to build their skill set and try other things like coasting or going faster. Having others around will provide a sufficient distraction to get their mind off their fear. The same applies to you. Ride with your child to further reinforce those positive associations. Make a game of it with activities like follow the leader. As we mentioned earlier, you can use a regular bike like a balance model with a few minor adjustments. You’ll need a wrench and a tire pressure gauge to get started. First, take off the pedals and cranks. Next, adjust the seat height to fit your child. Remember that their knees should be at a slight angle when they’re seated on it. Finally, make sure that you inflate the tires to their proper pressure. Doing so will make pedaling and gliding smoother and easier. That’s essential because your goal is to make the riding experience pleasurable and care-free for your child. In their mind, simple equates to fun which is what you should encourage. There you have it, everything you need to know about choosing the right balance bike for your child to how to teach them to take their first ride. As you can see, these bicycles run the gamut from age-specific models to ones that you can convert into your child’s first regular bicycle. Take the time to review the specs as you shop. Weight and seat height are the crucial ones that will determine how suitable a model is for your child. Keep in mind the developmental milestones in their development as well to make an informed choice. Biking is a fun activity with numerous health benefits. That makes teaching this skill so essential for parents for providing a solid foundation for future enjoyment. Really its great Thank you so much for sharing this.